Crafting in A:ir offers some of the best in-slot gear available, requiring the player to collect material from nodes in the open world, farmed materials in the farmsteads and farming dungeons for the high-end recipes. Utilising both instanced and open-world Housing. The initial player housing area, unlocked via the story quest line, is the instanced based crafting area located in the main city of Norseguard. Once unlocked this area can be reached by either going to Norseguard, or by activating the home icon in the bottom right menu. This icon can be used to “teleport” the player to the housing area from any point on the map. By walking away from crafting area, the player will enter the city proper (i.e. a cheeky return), or if the player enters the pink teleport strand the player will be returned to their point of initial teleport. 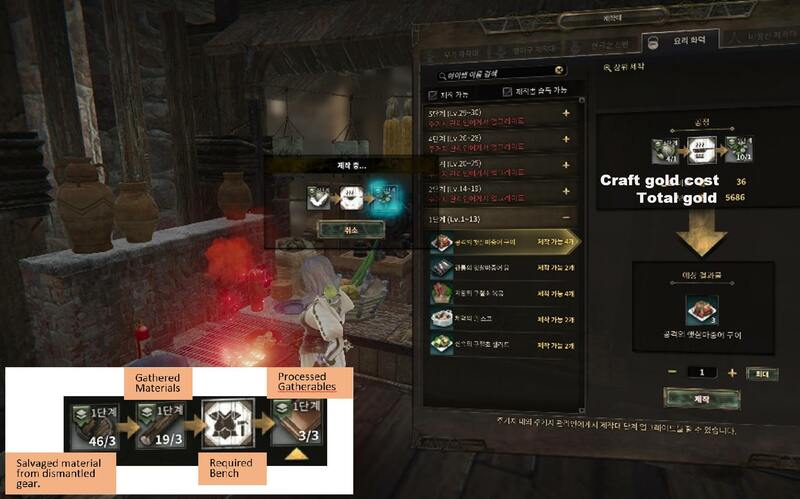 When the player interacts with the crafting benches the crafting menu is invoked (shown below). 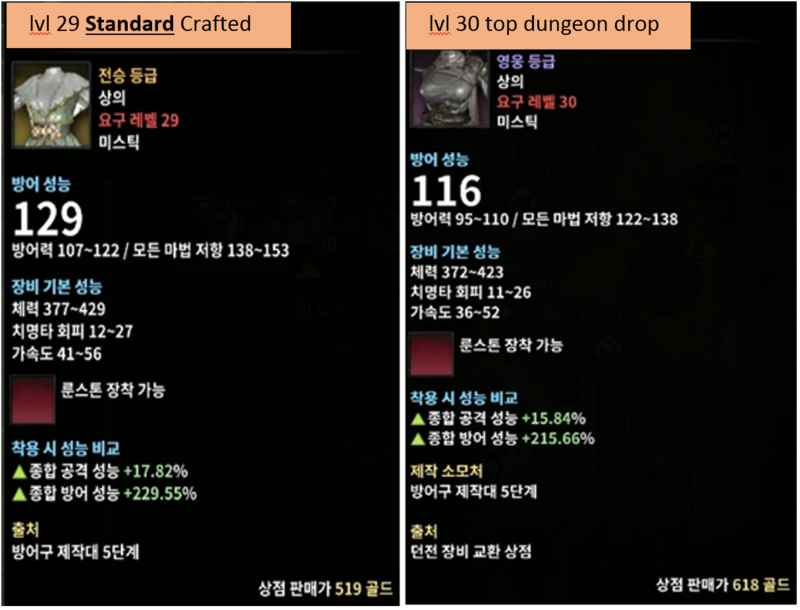 The different crafted items are broken down into Tiers by level blocks. Craft able tier items are shown in white (red shows unlocked tiers). Each craft able item requires a number of gathered items, salvaged material and possible items that need to be crafted (or processed) themselves, such as iron-bars, nails etc. The crafting process is quick with little delay. The stats of the crafted gear is predetermined, what you see in the preview window is what you get. Note that you can only craft items usable by your class. 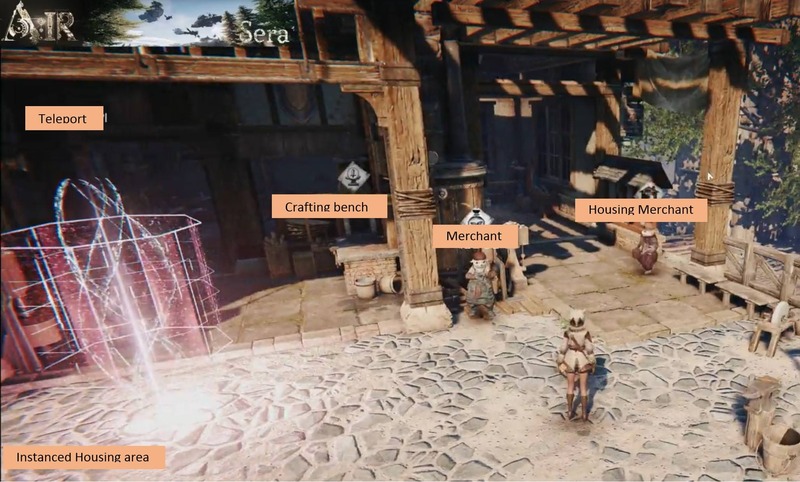 To enable crafting of higher tier gear you need to upgrade the appropriate crafting bench to the higher tier. This is achieved through the housing merchant. 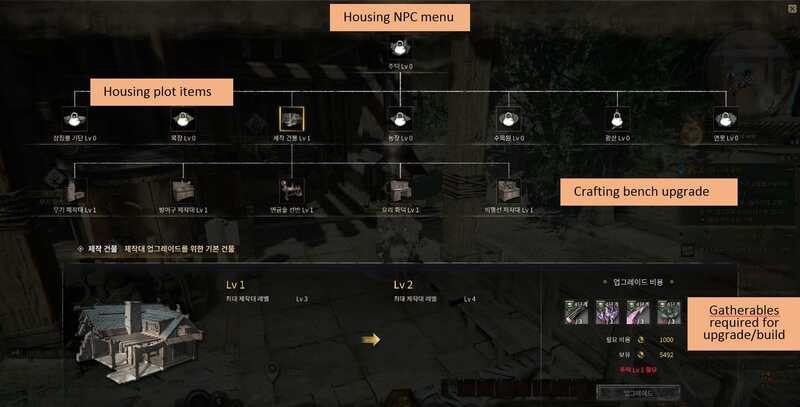 The housing Merchant interface enables the player to create the open works housing equipment and to upgrade workbenches to higher tiers. The upgrade process requires the player to provide a number of gathered items, and possible items that need to be crafted (or processed) themselves. After crafting the player immediately gains access to the next tier of crafting for that bench. By default crafted gear is of high quality, with stats better higher than drop gear. Although the random rewards form dungeons include much higher quality recipes, such as GOLD quality recipes. This crafted gear appears to be the best in slot gear available in game. The recipes available as drops from the dungeons can be viewed from the progression rewards interface (‘X”), as can the dungeon dropped gear. Crafting of Accessories (necklaces, rings, earrings, lanterns, broches) is done via the skill window. The way Accessories work is tied to specific skills, by clicking on a skill in the skill window you will see which Accessory a particular skill is associated with. The crafting of accessories requires components that only drop in dungeons. The production of these Accessories is then done in the accessory window by simple clicking on the item to create. Note: As of the CBT there are no gateway limiting processes to crafting (such as the labour point systems of BDO, AA, etc). Ael431, Lhyuu, SirWallace and 12 others like this. Thank you so much Sera, lovely guide, helped a lot to get to know the crafting system just a little better. Note that you can only craft items usable by your class. Really ? and what we know about game economic system ? does it mean that we can't trade our crafted items ? does it mean that we can't sell our crafted items ? is this game a new Solo MMORpG ? Hi, for CBT-1 lots of functionality was not enabled, such as trading and the AH... We know trading will be enabled at launch ... in terms of the range of crafted gear I do not dont know yet if this will/will-not be expanded. Please do !!! The more people we can get information to the better for all. Also pleased to see crafting is more important than dungeons. A question tho: Do items need repairs? If so, only Gold or items + crafting mats (+ maybe even a crafter) like in FFXIV? - During CBT-1 worn equipment had no durability. - Animal Mounts exhibited a "stamina" that decayed over time, which when got to zero the mount would stop, you then have to wait for the endurance to recover before reuse. - Mechanical mounts take damage, which you do have to use a vendor brought repair kit. alxndr and Xash like this. Thank you very much for the guide, looks like I'll have to do some PVE to get my smithing on . Awesome guide , cheers for taking the time to do it! Sounds great , looking forward to it . Curious about both of those , to be fair watched fair amount of your vids , cant wait to get my hands on the game!